Some of Britain’s best-loved TV and film stars are appearing together on BBC television in aid of Comic Relief. This year’s highlights include One Red Nose Day and a Wedding – Richard Curtis’s mini sequel to his smash hit 1994 film Four Weddings and a Funeral. But One Direction star Louis Tomlinson pulled out of his planned performance following his sister’s sudden death. The last Comic Relief in 2017 raised more than £76m to help vulnerable people in the UK and around the world. The charity telethon, set up by Lenny Henry and Richard Curtis, is shown on BBC One every two years. 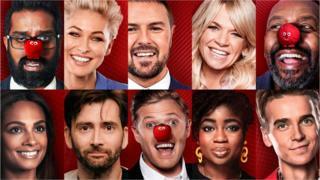 Henry is among this year’s hosts, as are David Tennant, Zoe Ball, Emma Willis, Romesh Ranganathan, Paddy McGuinness and Alesha Dixon. This Abba musical sequel spoof is written by and stars Jennifer Saunders. It comes a decade after Saunders sent up the first Mamma Mia film for Comic Relief. The cast features a host of celebrities including Alan Carr (as Colin Firth’s Harry), Gemma Arterton (as Lily James’s Young Donna) and Sue Perkins (as the film’s producer). You can see Carey Mulligan (as Amanda Seyfried’s Sophie) interacting with Miranda Hart, who’s playing the director, here. What will have become of the characters a quarter of a century on? 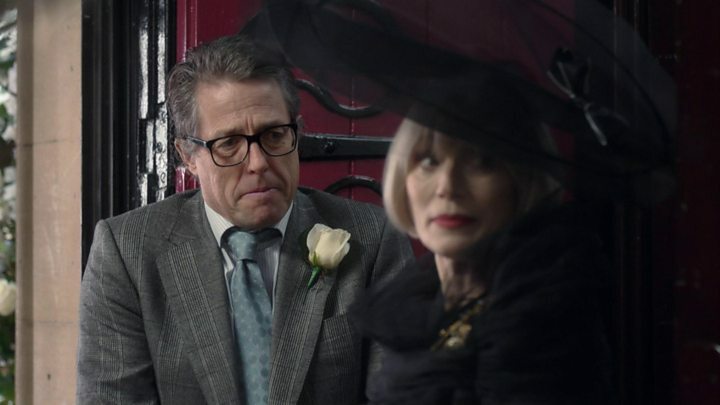 Richard Curtis’s sequel to his smash hit Four Weddings and a Funeral – titled One Red Nose Day and a Wedding – has been heavily trailed and highly anticipated. Curtis wrote the script for the short film and Mike Newell has returned to direct. Most of the original cast have come back and will be joined by some new faces, including actress Lily James, Good Morning Britain’s Susanna Reid and a mystery wedding singer. He didn’t do the greatest job of looking after the home secretary in BBC One’s smash hit thriller, but Bodyguard’s David Budd (Richard Madden) is back in action for Comic Relief. This time his mission is to protect the Red Nose. Madden will be joined by Bodyguard co-stars Gina McKee and Vincent Franklin plus comedian Sanjeev Bhaskar, with a script written by Bodyguard creator Jed Mercurio. Things are looking up for Steve Coogan’s long-running comedy character Alan Partridge. The North Norfolk Digital DJ is the new presenter of BBC One’s This Time. He’s hoping to capitalise on his TV comeback as he tries to raise money on the streets of Norwich with his trusty sidekick Simon Denton (Tim Key). Comic Relief switches to BBC Two at 22:00 GMT, where there will be a special edition of University Challenge. Guest host David Baddiel will be offering starters for 10 to celebrities including Emily Atack, Martin Freeman, Kerry Godliman, Darren Harriott, Vick Hope, Jason Manford, Luisa Omielan and Judge Rinder. Viewers will see performances from the casts of Only Fools and Horses: The Musical and Magic Mike Live. Plus, the cast of Mischief Theatre will perform a live magic trick. Claudia Winkleman and Tess Daly have already raised more than £1m with their 24-hour danceathon, and nine celebrities have climbed Kilimanjaro for the cause. But this year’s event has not been without controversy in the build-up. Presenter and Strictly Come Dancing winner Stacey Dooley attracted criticism from MP David Lammy after she travelled to Uganda to report on Comic Relief’s work there. The Labour MP for Tottenham said she had been portrayed as a “white saviour”, which he said “sends a distorted image of Africa which perpetuates an old idea from the colonial era”. In response, Comic Relief thanked Dooley for making a film in which “people working with or supported by Comic Relief projects tell their own stories in their own words”. Meanwhile, pupils at a school in Cardiff decided not to wear red noses to take a stand against the use of plastic. Instead, children at Ysgol Treganna painted their noses red.